Meatwad: Hey, how come the shower ain't working? Master Shake: I don't know. Probably maybe something you did to anger God. He's angry with you all right. I remember him telling me that at the Last Supper. Yeah! They had good fish there. It has been said that Aqua Teen Hunger Force is an acquired taste. 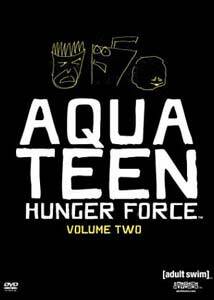 Aqua Teen Hunger Force: Volume Two contains even more zanier episodes than Volume One did, which will make the audience's reaction ever more severe. Some will hail these 13 episodes as brilliant, while others will look at them as horrendous pieces of trash. For the past few years the show has fared well with its devoted Adult Swim audience, but it remains to be seen if it can grab the attention of mainstream television viewers (word of council: if you've never heard of the Cartoon Network's Adult Swim, you probably won't like Aqua Teen Hunger Force). The show is quite simple in terms of style and plotting, but there's a charm and wit to the animation, characters, and writing that can't quite be explained. The premise of the show is so bizarre that one wonders how it ever got the greenlight. Three fastfood products�Master Shake (a lime, man-sized milkshake voiced by Dana Snyder), Frylock (a floating order of French Fries voiced by Carey Means), and Meatwad (a ball of beef deemed unacceptable for a hamburger voiced by Dave Willis)�live together in a New Jersey suburb. They occasionally solve crime, save the world from aliens and robots, and invent new products. Considering how difficult such tasks seem, it is amazing that the trio somehow always manages to irritate or maim its neighbor, Carl (also voiced by Dave Willis). These are the basics of Aqua Teen Hunger Force. There is no way to accurately relate the humor of this series, because so much of it comes from the attitude of the characters. More than any other cartoon on Adult Swim, the voice talent involved here is essential. Dana Snyder's Master Shake is something to behold. In the episode Super Hero, Shake steals radioactive waste to mutate himself into Mr. Drizzle, a new hero who can summon rain at his will. Unfortunately, nuclear toxins don't grant him superpowers and Shake has to make a name for himself the old-fashioned way: by burning the whole city. The show portrays violent and atrocious acts (such as in Cybernetic Ghost of Christmas Past, which has Carl's swimming pool filled with blood) with a casual disregard for the weight of such material. It is understandable how some viewers would find such reckless treatment of grave matters indefensible, but the timing is just so hilarious. Show creators Willis and Matt Maiellaro have sidestepped the postmodern stylings of Family Guy to create a contemporary gem. Master Shake is the heart of the show's comedy, with his illogical schemes and unpredictable temperament. When Meatwad becomes enamored with a rapper's new album in Super Sir Loin, Shake threatens to kill him with a chainsaw. Over the top? Yes. But the dialogue and voice work combine to create a perversely witty scene. The other members of the Hunger Force also provide a wealth of laughs. Meatwad learns to predict the future in Meat Zone, predicting a disastrous future for the chocolate milk. Frylock, the mature and intelligent Aqua Teen, develops a new computer in Super Computer that allows a person to connect with any other individual in the whole world. Alas, the computer's modem is so fast that it travels back in time and stumbles upon a primate. Evidently, Frylock's computer is the missing link. No amount of explaining Aqua Teen Hunger Force will adequately describe the humor in this low-budget animated show. The lucky few will be treated to one of the funniest shows on TV. The slapdash animation has an endearing charm that perfectly fits these unbelievable characters, making for a laugh-out-loud experience. As difficult as it is to explain this show to those who have never seen it, there is another element in this review that is even harder: choosing only one quote. Image Transfer Review: Presented in its original aspect ratio of 1.33:1, Aqua Teen Hunger Force looks pretty solid. There is no evidence of mosquito noise, edge enhancement, or print defects. This nonanamorphic transfer delivers solid colors (especially for Frylock) and firm contrast. The CGI animation, particularly Universal Remonster, is also well represented. The animation may not be exciting, but the transfer makes it look as good as it ever does. Audio Transfer Review: Presented in Dolby Digital 5.1, Aqua Teen Hunger Force sounds as good as it looks. There is a lot of sound separation across the main speakers, creating a wide soundstage. Sound effects and dialogue travel across the speakers in a manner complimentary to the visual placement of the characters. The dialogue is easily understood and well balanced within the mix. There is a limited amount of bass, but there is some nice use of the surround speakers. Each episode's opening at Dr. Weird's laboratory has some nice rain in the surrounds. Cybernetic Ghost of Christmas Past From the Future's mix is reference quality, on account of the ghost's voice. Some people might call this mix gimmicky, but they probably wouldn't like the show either. Aqua Teen Eat Promotion—an outtake from Baffler Meal relating to a promotion of the Aqua Teens' restaurant. Baffler Meal—an episode from Space Ghost: Coast to Coast featuring the Aqua Teen Hunger Force characters. Baffler Meal Music Video—the performance of the song featured during the closing credits of Baffler Meal. Extras Review: The weakest portion of this DVD is its extras. That's not to say that the extras are bad, they're just not what you would expect from Warner. Both discs contain a Play All function for the episodes. All of the featurettes are found on Disc Two. There are three episode commentaries for Super Trivia (featuring Dave Willis, Matthew I. Jenkins, C. Martin Croker, and Bob Pettitt), Meat Zone (with Jay Edwards, Ned Hastings, Scott Fry, and Craig Hartin), and Cybernetic Ghost of Christmas Past From the Future (by Dana Snyder, Carey Means, Matt Maiellaro, and Dave Willis). These commentaries are not listed with the other extras, but are accessed when you select to play the respective episode individually (they also have remote access). As you can tell by the names, many of the men participating are behind-the-scenes animators. The episodes are only eleven-and-a-half minutes apiece; hence there is not enough time for any significant information to be discussed. Most of the participants sound alike, making it a confusing experience. Both Dana Snyder and Carey Means are very funny in their commentary, but only the most die-hard of fans will want to listen to these tracks. There also is an episode from Space Ghost: Coast to Coast featuring our triumvirate of characters. Baffler Meal (12m:11s) is an episode that was meant to first introduce the characters to the world. The character designs in this episode are radically different from the actual series, and the jokes fall flat (especially the appearance by Willie Nelson). There is an optional commentary by Matt Maiellaro, Dave Willis, and Jay Edwards. Rather than watching the actual episode, listen to this commentary and you'll get some brief, interesting stories about the network's original response to ATHF. There is also a music video (03m:09s) relating to the closing credits of Baffler Meal. Next is Future Wolf II: Never Cry Wolf—Origins of the Series (06m:07s). Presented in Dolby Digital 5.1, this is a mockumentary about the show's creation. According to the short movie, a wolf from the future travels back in time to create the show so the world can be saved. If you are a fan of the series, the humor here will be up your alley. There also is Future Wolf III (18m:51s), which is a slideshow of character designs, artwork, storyboards, and behind-the-scenes photos set to music from the show. At first it is interesting, but it goes on for too long. The final extras are four deleted scenes, one from each of the following episodes: Super Model (:30s), Cybernetic Ghost of Christmas Past From the Future (01m:01s), Baffler Meal (01m:04s), and Super Birthday Snake (:03s). To be honest, these are actually extended scenes. All of them were wisely cut out of their respective episode, and cannot deliver a laugh when viewed as a supplement on the DVD. This collection of extras may not be what fans of Warner have come to expect, but it is better than most TV shows on DVD. Warner Home Video continues its fine work with Aqua Teen Hunger Force: Volume Two. The picture is strong and the Dolby Digital sound mix is a lot of fun to listen to. The extras are a mixed bag, with some humorous gags. However, the best thing about this DVD is the show itself. If you are at all interested in far-out animated series, buy this set sight unseen.